1) Group A at 6.30 a.m.
Those who do not come under the time limits shown above. Registrations not subject to the draw: packages, 2018 cancellations (except those entitled to a previous grid). Cyclists who start before the assigned group will be disqualified. 4 Routes: There are 3 possible routes for the 2019 Maratona dles Dolomites - Enel. Participants are free to select the route best suited to their ability, also during the course of the event, entirely according to their own judgement. Open to all male and female riders aged 18 (eighteen) or over. Cyclists older than 64 (sixty four) may just run the shortest courses (55km and 106 km). Professionals and cyclists of the Elite category who have a Professional or a Continental contract in 2019 or in the last 4 years (2015 – 2018) are not admitted to the race. For females the same rule applies but it is limited to 2019 and the last 2 years (2017 – 2018). Cyclists (men and women) with an Elite license without contract in 2019 or in the last 2 years (2017 – 2018) are not admitted to the event. U23 athletes can participate if they are not in the time conditions which do not allow the enrolment as amateurs cyclist: for the two years following the last membership in the category; U23 athletes with an only year of membership in the category: for one year following the last membership in the category. Professionals can be admitted exclusively for promotional purposes and subject to invitation by the Organizing Committee and may not take part in any way in the ranking. The 2019 Marathon is by invitation and the Organising Committee may decide at any time whether to accept or not the enrolment or to exclude at any time an enrolled contestant for the event that may damage the image of the event. No registrations from participants who have been sanctioned by Sporting and/or Ordinary Justice, for a period of time longer than 6 (six) months, for reasons related to doping will be accepted. The 2019 Marathon has a closed number of registrations to be divided equally between Italian and International contestants. The cyclists who have not regularly registered for the race cannot join the groups, on pain of exclusion. In the event of an accident, they will be reported in accordance with the law. The 2019 Marathon estimates a participation of approximately 9.000 competitors divided as follows: 4.200 entries by draw among all pre-registrations; 4.000 entries reserved for official tour-operators, registrations not subject to the draw, registrations whose surcharge will be assigned to charitable institutions and invitations. Registrations not subject to the draw are the ones made by “fidelity members”, members who participated and concluded at least 13 (thirteen) editions of the Maratona, and the cancellations in 2018 that have regularly sent the request for deferring the participation fee to 2019 edition. In 2020, to be included amongst the “fidelity members” it will be necessary to have completed 14 (fourteen) editions and from 2021 15 (fifteen) editions. In addition, 50 entries will be drawn among pre-registered cyclists of non-European nationality. The 4.200 entries by draw will be divided in single requests, cumulative requests with 2 (two) to 4 (four) members or cumulative requests with 5 (five) or more members, in proportion to all requests sent to the organisation. It will be possible to pre-enter for the 2019 Maratona from October 18th to November 8th 2018. Pre-entries sent prior or after that date will not be taken into consideration. 194 registrations whose surcharge will be assigned to charitable institutions will be sold online on www.maratona.it departing 28th November 2018 and other 194 registrations departing 28th March 2019. 8.1 Who needs to pre-enter: the pre-entry has to be sent by all participants who want to take part in the race including the “fidelity-members” who do not need to participate at the draw. No pre-entry is required for participants that transferred their 2018 registration-fee to 2019 within the terms, for participants buying a package by our official tour operators or registrations whose surcharge will be assigned to charitable institutions. Participants who transferred the registration to 2019’s edition will be sent by email the indications on how to confirm their participation to the race in July 2019 within April 18th 2019. 8.2 How to pre-enter: The pre-entry can be made exclusively online by completing the pre-entry form on our site www.maratona.it indicating following data: surname, name, address, nationality, date of birth, gender, e-mail, mobile number and jersey size, and paying the pre-entry fee of 2,00 € by credit card, bank transfer or other payment modalities depending on the country. Pre-registrations on paper will not be accepted. The Maratona dles Dolomites Committee reserves the possibility to accept pre-registrations/payments. Only one entry request per person is admitted, participants who send a double entry will be disqualified for the next two years. The draw will be held on the second half of November 2018 and the participants admitted to the race can definitely register for the race from December 3rd 2018 till April 18th 2019. The complete list of participants drawn will be published on our website a day after the draw. Sports clubs have to do a cumulative payment in order to be extracted as a group. For the draw they will be given a number (means one possibility) pro group. • download the Excel document for group pre-registration from the online pre-registration procedure, fill it in and upload it online and make the joint payment. 9 Participation fee: is 115,00 € + 10,00 € for the guarantee deposit of the chip (10,00 € will be reimbursed on arrival subject to return of the chip). The 2,00 € pre-entry fee is not part of the registration fee and will not be returned or considered as payment on account. Please note that the chip costs 35,00 € and that if the chip is not returned, the difference of 25,00 € will be requested. In the event of failure to return the chip or to pay the difference, no entry will be accepted for the following years. The chip must be returned together with the tag of the bike on which the chip is fixed. Payment of the entry fee entitles participants of using the repair service (spare parts not included), assistance and refreshments along the route, pasta-party at the finish, maratona jersey, race number (the front tag with the chip must be returned), infos by e-mail and sms; free participation at all activities during the biker’s week. The classification will be published on the Maratona website www.maratona.it where the participants can also download and print their diploma. The confirmation of entry needs to be done exclusively online on the official website www.maratona.it with payment by credit card, bank transfer or other payment modalities depending on the country. The payment fees which vary depending on the chosen payment modality are shown in the payment procedure and are at the expense of the participant. Each participant registered individually will receive by 28th June 2019 by e-mail the voucher with the assigned number that is necessary together with an original valid ID (identity card, passport or driving license) to collect the material of the Maratona in the four days before the event. A pickup from third parties is not accepted. For the registration of teams, a joint payment must be made indicating the booking codes of the individual participants to be registered. A cumulative pick up of the starting material for the teams is not foreseen. Fidelity members, participants who already transferred the registration from 2018 and participants admitted to the race because not drawn in 2014, 2015, 2016, 2017 and 2018’ editions cannot be replaced. The transfer of the registration to another person precludes the possibility of being registered again by other modalities in the same year. Any extensions of the closing date of the replacements will be notified on the website. Those unable to participate are not entitled to any reimbursement of their fee. There is no provision to send race packs direct to home addresses. If a withdrawal is announced before 18th June 2019, the only participation fee (115,00 €) can be transferred to 2020. The entry deemed valid for the following year is nominal and cannot be transferred to third parties and is valid only for the year following any withdrawal. In the event of non-participation, the fee paid will not be reimbursed. For 2020’s participation the indications on how to pay the difference of participation fee and how to confirm the registration 2020 will be sent in October 2019. • Wednesday, 03.07.2019 from 8.30 p.m. to 10.30 p.m.
• Thursday, 04.07.2019 from 8.30 p.m. to 10.30 p.m.
• Friday, 05.07.2019 from 2 p.m. to 7 p.m.
• Saturday, 06.07.2019 from 10 a.m. to 7 p.m. The starting number needs to be picked-up personally with an original valid ID (identity card, passport or driving license) and on handing over the voucher. No copies of ID’s or other ID’s allowed. A pickup from third parties is not accepted. Finish: 55km 1 p.m. 106km and 138km 4.15 p.m.
Times are valid for all, regardless of starting times. Passo Sella 11.15 a.m. Colle S. Lucia 12.15 p.m.
Passo Campolongo 12 noon Passo Giau 2 p.m.
Passo Gardena 12.15 p.m. Passo Falzarego 3.45 p.m.
Road closures are established by the various local prefectures and are guaranteed until the final race car marked as “fine corsa” has passed. 16 Checkpoints: Observance of these is mandatory, both at the start and along the chosen route. Anyone starting before the official starting signal is given, or whose start is not registered by the officials, shall be considered a non-starter and their name will not appear in the finishing order. With reference to the UCI and FCI Regulations, paragraph 1.3.010 and 12.1.013 bis technological fraud, the competition jury, with the technical support of the organization, is authorized to perform spot checks or systematic checks. Non-compliance or refusal to be subject to the required technical checks implies immediate disqualification and a report shall be made to the relevant bodies. All the competitive and amateur cyclists will take part in the individual classifications. Placing will be established according to time taken to complete the race, not according to the order of arrival, except the first place riders, who will be established by the judges at the finish line according to FCI (Italian Cycling Federation) regulations. Team classifications are for a minimum of 25 participants registered together as a single team, who must finish within the time limit. The official awards ceremony will take place at 4 p.m. in the ice stadium. Following prizes will be handed over: the top 3 (three) teams of the team classification, the first 3 (three) in the overall individual classification and the first classified in each category for the medium and Maratona distances. The Sellaronda course does not foresee an official classification. Prizes will be handed over only to winners taking part at the ceremony. 18 Medical service: The medical backup service comprises ambulances manned by doctors and nursing staff with helicopter support. Participants are responsible for covering any costs for their own transport to hospital. 19 Mobile and mechanical assistance: The assistance of private vehicles following the race is strictly prohibited, under penalty of disqualification of the athlete. 20 Definition of the event: The “Maratona dles Dolomites - Enel” is a large-scale event for touring cyclists. 21 Protests: Any protests must reach the jury before the specified deadline, together with the fee as laid down in the Italian Cycling Federation regulations. If the event has to be cancelled due to exceptional circumstances there is no refund of the entry fee but the organisation reserve the right to start in 2020 after completing the registration procedure as requested for coming edition. In the event of cancellation of the event before the chip is delivered, the amount of €10,00 will be credited for the next edition therefore in this case the participant will only have to pay €115,00 the following year on registration. 25.1 Carry the number on the handlebar including the transponder and a number on the back provided by the organisation. The format of these numbers may not be changed. 25.2 Use the approved hard helmet fastened throughout the race. 25.3 All participants must obey the rules of the road. Please be aware that cyclists who are overtaken by the “end of race” vehicle marked as “fine corsa” shall continue along the route of the event, maintaining both numbers. They must, however, be aware that they won’t have any form of protection as the section of road they will be following will be open to traffic. 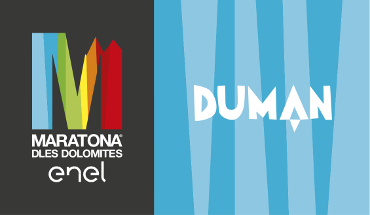 25.4 The first three male and female winner in the Medium and Maratona routes in 2018 must, if registered, wear the "duman" (“tomorrow”) jersey provided by the organisation showing their place the previous year. On the jersey which will be personalized at the discretion of the organisation, each athlete may put the name of their club and of their main sponsor with a maximum height and width of 20 cm. Failure to wear the jersey will lead to disqualification from the event. The jersey must be visible for the whole of the race, anything worn on top must be transparent and leave the jersey visible. The remainder of the clothing is that of the club. 25.5 The first absolute 3 (three) classified of the Maratona and Medium routes must take part in the official awards ceremony scheduled for 4.00 p.m., on pain of exclusion from the Maratona dles Dolomites – Enel for the following year. By attending the awards ceremony (ranking list general and categories), they will acquire the right to pre-register and take part in the 2020 Maratona without having to go through the draw, save cases of exclusion as per the regulations. 25.6 The road between Corvara and La Villa will be closed to traffic (including cyclists) at 6.10 a.m. The cyclists should therefore take due note. Anybody who has not entered the grid 15 (fifteen) minutes before the start will be automatically diverted to the last starting grid. 25.7 It is compulsory to carry a kit for puncture repairs during the race. Carry spare clothing and a waterproof garment in case of bad weather. 26.1 Participants wearing the number of another cyclist, giving the number to others, starting in a grid prior to the one assigned or any other grave fact which is detected by the organisation will be punished by disqualification from the event for one up to five years (in several cases the organisation reserves to give a lifelong disqualification). The above measures will be adopted by the organization. 26.2 Participants are asked not to throw litter on the roads, but to put it in the special containers at the refreshment points identified by a start and end of refreshments. Competitors who litter outside the marked areas will be excluded from participation the following year. 26.3 The organisation also reserves the right to take measures where an unfair behaviour is noticed during the last 5 km (from the junction of La Villa) of the medium course (106 km) and of the Maratona course (138 km), tending to distort the order of arrival of the races. 27 Rules: For everything that is not contemplated by these regulations, the general rules issued by the National Amateur Cycling Commission of the F.C.I. (Italian Cycling Federation) apply. By sending the online registration form, the competitor must declare that he/she has carefully acknowledged and unconditionally accepted the regulations of the Maratona dles Dolomites – Enel 2019 published on the website www.maratona.it in every point thereof and that he/she possesses the medical certificate of physical eligibility according to the Italian D.M.V. 18/02/82, private accident insurance and third party liability insurance. Each participant carries the complete responsibility for his state of health on the marathon occasion. For accidents during the race the organisation committee will not take upon the liability. In relation to the information notice according to Art. 13 of EU Regulation 679/2016, the competitor must declare that he/she has viewed said information notice published on the website www.maratona.it and that he/she has been informed as to the compulsory nature of providing consent for the related processing for the purposes indicated under Art. 2) of the aforementioned information notice, through selection for acceptance of the relevant box on the online registration form for the processing of personal data, aware that failure to provide consent for processing of data for the aims indicated in Art. 2) of the information notice, will imply the impossibility to proceed with the registration for the activity in question. The data must be complete and legible also for insurance purposes. With consent for the processing of his/her personal data the competitor expressly authorises the Maratona dles Dolomites Committee for his/her data to be transmitted and processed also by third parties who offer services connected with the Maratona such as: those having the purpose of delivering and/or sending the gadgets purchased by the competitor, those having the purpose of timing the races, drafting and announcing lists of results and those having aims such as photographing or filming the competitor. According to Art. 4 of EU Regulation 679/2016, processing of personal data means “any operation or set of operations which is performed on personal data or on sets of personal data, whether or not by automated means, such as collection, recording, organisation, structuring, storage, adaptation or alteration, retrieval, consultation, use, disclosure by transmission, dissemination or otherwise making available, alignment or combination, restriction, erasure or destruction”. In relation to the lists of results and classifications, the publication of photos, videos and audios and/or video recordings of any kind, the company will use such data and images of the athlete for internal and external use (various publications, sports films, electronically and on the company website www.maratona.it). In relation to the images and/or video recordings, the athlete may appear alone or together with other subjects during the initiatives promoted by and for the Company. The Organisation must be authorised by the competitor for the aforesaid processing; the competitor must be informed of the possibility of the right to revoke the processing which can be exercised at any time by writing to SSD Comitato Maratona Dles Dolomites, Via Damez 34, 39036 Badia (BZ) -Italy; info@maratona.it. • he/she has never carried out medical practices that were not justified with documented pathological or therapeutic conditions, aiming or suitable to change the outcome of anti-doping tests concerning the usage of forbidden medications. Untruthful self-certifications will be prosecuted according to the law. In the event of a positive result at the anti-doping tests carried out in the Maratona dles Dolomites - Enel, or of positive results ascertained in the 6 (six) months following the Maratona, at other sporting events, the competitor is obliged to pay the Organizing Committee of the Maratona dles Dolomites, by way of compensation for the major damage to the image of the event, the sum of € 50.000,00 (euro fifty thousand/00). If the competitor belongs to a sports club, the latter will be jointly obliged to pay this fine. The sums that are collected by the Organizing Committee of the Maratona dles Dolomites, by way of compensation for damage to the image, will be donated in full to support young people’s sporting activities.